The Surva Masquerade Games, staged in the town of Pernik each January, have been picked by the editors of National Geographic as one of the 15 best winter destinations worldwide. 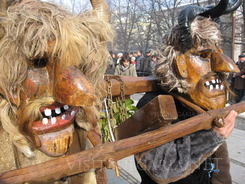 The Bulgarian festival is recommended along with world-recognized festival cities and exotic destinations like Paris, Lake Baikal in Siberia, Russia, the Winter Wolf Viewing in Yellowstone National Park, the Whitefish Winter Carnival World Ski Joring Championships in Montana, USA, the Almond Blossom Season in Mallorca, etc. “Western Bulgaria’s rural masquerade rituals are fueled by a primal energy: animalistic masks, beating drums, fire jumping, rhythmic chanting, clanging bells. It’s all on display at the Surva International Festival of Masquerade Games, staged each January to banish evil spirits and clear the way for a prosperous year,“ the National Geographic editors wrote. The Surva XXIII International Festival of Masquerade Games will take place between January 24-26.